"Hotels tend to have quite a bit of flexibility on certain things, but no one asks, so they aren’t always offered." Many of my clients get a case of the heebie jeebies when it comes to negotiating a hotel contract. They are anxious about asking for freebies or perks. Let’s face it - hotel contracts are intimidating. If you are not a lawyer all that jargon makes no sense at all! 1. Complimentary WiFi – almost everyone is carrying around a phone, tablet and/or laptop when they travel. 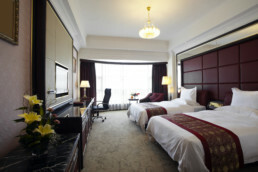 WiFi is a hot commodity as well as staying connected in guest rooms, meeting space and common areas. Don’t be afraid to ask for it! 2. Suite Upgrades – Whether you’re looking to impress your boss or need a hospitality suite, suite upgrades are a huge cost savings. You can also keep them in your back pocket for when you have a dissatisfied client or stakeholder. There’s nothing like a room with a view! Curious about what else you can ask for? The truth is there are many things you can ask for as hotels tend to have quite a bit of flexibility on certain things. What is important to remember is to prioritize by asking for the concessions that you really need (and want) for each meeting/event based on the specific needs of your attendees. The Bottom Line - don’t be afraid to ask. What’s the worst they can say? PS – We’ve got more hints on hotel concessions in our eBook or simply set-up a 15-min consultation with me and I’ll walk you through it.